Kershaw Knives is a subsidiary of the Japanese KAI Group, one of the biggest knife manufacturers in existence. KAI also owns the Zero Tolerance brand (which I liken to a Lexus to Kershaw’s Toyota) producing high end heavy duty knives, as well as Shun, a high end kitchen knife brand. Pete Kershaw started out as a sales representative for Gerber in the 60’s, and started his own brand with his namesake in 1974. Many of the blades were outsourced to KAI in Japan, who later acquired the brand and formed KAI USA in the 1980’s. The brand has expanded continuously from there, to be one of the best known names in knives all over the world. 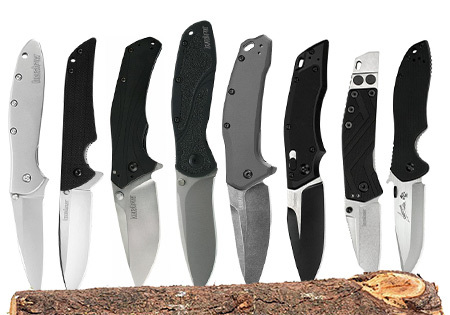 Make no mistake, there’s a massive spread of products in the Kershaw portfolio today, not even considering the piles of fantastic discontinued products. Here the team at Knife Informer is proud to share our view on the best Kershaw knives for your money in the market today. The Leek may well be the most iconic knife Kershaw has ever produced, the knife most closely associated with the brand name. It is to Kershaw what the 110 is to Buck, the Spartan is to Victorinox, or what the 710 is to Benchmade. Why all the love? The Leek has been around for a long time – in fact, it’s still in production seven years past its designer’s departure from Kershaw. The Leek was designed by Ken Onion as part of a series of organically shaped knives named after onion derivatives (including the shallot, chive, and scallion) that excels as a lightweight EDC blade. The thin profile (only 0.35” thick!) makes the Leek a fantastically carryable knife, virtually disappearing in your pocket. It also employs Kershaw’s Speed Safe technology, which uses a torsion spring hidden in between the handle and the liners to spring the blade open one you push it out the first 10% or so. You can pick between a flipper tab or a thumb stud to pop the blade open, and the super light blade means the Leek has an incredibly snappy action. The blade shape is what brings people back to the Leek: the 3” modified wharncliffe shape creates a needle-thin point that is a fantastic penetrator, and with ultra-thin 0.09” blade stock and a slick hollow grind the Leek can slice with the best of them. There’s a range of materials and prices from the standard aluminum handled liner lock with Sandvik 14C28N steel, up through the new carbon fiber handled model with CPM-154 steel for a bit more. There have been countless special variants of the Leek over the years including hard the to miss Rainbow models, and the composite steel blade model that combines a hard D2 cutting edge with a 14C28N spine bonded together with copper. The Leek is a “knife guy” must have; if you haven’t owned one yet you will at some point. All Leeks are built in the USA and have build quality well above their reasonable price points, something that’s becoming less common with Kershaw these days. Another of Kershaw’s “greatest hits” that has been around for a long time but would cause a riot in the streets if it were ever discontinued, the Skyline is lightweight minimalist EDC perfection. It’s similar in size to the Leek but trades a lot of the Onion designed knives’ features for a single piece G10 scale and backspacer, and a slick manual flipper action. At only 2.5 ounces the Skyline is a great summertime carry option, since the wide clip grips the pocket securely and the weight won’t drag your shorts down. The minimalistic design may not raise any eyebrows but it’s the kind of clean and simple ergonomics that just work; the deep finger choil creates a strong grip when open, and the gentle curves of the handle fit most hands perfectly. The 3.125” blade is made of stonewashed Sandvik 14C28N steel like the Leek, with a slick hollow grind for good slicing abilities, and the drop point shape is the textbook definition of practical. The Skyline is the type of knife that doesn’t blow your hair off with wild details or exotic materials, it just consistently works great for years and years. There is also a blackwashed blade version and a Damascus variant, as well as a number of discontinued special editions (some retailer special editions like a Cabela’s Orange handle and Blade HQ blue and red handle, and a rare flat ground S30V blade with blue handle model) if you’re into variety, but the standard Skyline at under $50 is one of the best reasonably priced everyday carry knives. The Knockout is one of the coolest knives Kershaw has made in quite some time. The name comes from where the aluminum handle is knocked out for the unique Sub-Frame lock, which functions as a frame lock (the lock bar is full width where it contacts the blade tang) but is thin in profile like a liner lock. Additionally, the scales serve as an integrated lockbar stabilizer to prevent overtravel, giving you the best attributes of both a liner lock and a frame lock. The aluminum handles are contoured on the show side, flat on the lock side, and the lock bar is black. On the standard version (black handles with a stonewashed blade) it blends in, but there’s also a flat olive green version with a black blade that provides a nice contrast between the handle and the lock. The blade is no slouch, either: made from Sandvik 14C28N, which strikes a perfect balance between edge retention and ease of sharpening, the Knockout’s blade measures 3.25” and sports a very high hollow grind for slicing ability. A mild drop point leaves plenty of belly for rolling cuts and a nice pointy tip, and Kershaw’s Speed Safe assisted opening mechanism pops the blade open from either a pair of thumb studs or a flipper. The Knockout is tapped for four-way clip mounting, and a deep carry clip buries it in your pocket. It’s a lot of knife for $65 retail. The Blur was another one of Ken Onion’s designs for Kershaw during his stint as a designer there, and it’s a beloved knife by many Kershaw fans. Like the Leek its claim to fame is packing a lot of cutting power into a small, slim pocketable package. With a 3.4” blade in a 4.5” long handle, the Blur hardly takes up any pocket real estate: the handle is less than a half-inch thick, and it tips the scales at only 3.90 ounces. Like a lot of Kershaw’s products there is a multitude of variants, but the standard Blur features aluminum handles with “Trac-Tek” inserts, and a stonewashed blade made from Sandvik 14C28N steel. A high hollow grind and a pronounced recurve boosts cutting performance but makes sharpening more of a chore. Tanto versions ditch the recurve, and some of them are available with a partially serrated edge. There are also tiger stripe variants, acid stonewashed blades, and a variety of handle colors. Of course there’s a slew of limited releases such as the blue/silver twill S30V version, a carbon fiber insert version, and desert tan handles with Elmax steel. There are also some versions which use Carpenter CTS-BD1, a new steel designed to be a domestically sourced stainless steel similar in performance to Sandvik 14C28N. All Blurs use Speed Safe assisted opening technology with a stepped thumb stud and kick open with serious authority. A classic among modern tactical folding knives, a Blur variant is a must-have for any knife nut. Prices vary from $45 up to $85 depending on materials and finish. If you like the Blur but want a flipper, the often-overlooked Camber offers a similar profile and features but with a Speed Safe-assisted flipper. Trac-Tek inserts and a deep carry clip offer a solid grip, and the flat ground 3” drop point blade is made from CPM S30V. At under 4 ounces and just about a half inch thick it also makes a fantastic daily carry knife. The Link’s internal model number is 1776 – they should have just called it the ‘Murica, because that’s the point of the Link: to bring back a high-quality affordable knife that’s made in America. It’s certainly attainable, with retail prices starting at $33 and topping out at $85. Considering it’s made in America that low price has to come from somewhere, and here it’s the steel: 420HC (high carbon) isn’t great on edge retention compared to more modern mid-range steels, but it does take a great edge easily. It’s just the right size for EDC tasks at 3.25” and like many of the best practical knives it’s a drop point with a high hollow grind and a swedge for a great balance of piercing and cutting. You have choices with the Link: lower priced models have injection molded GFN scales over stainless liners, while nicer version feature machined aluminum handles for a couple bucks more and an additional 0.7 ounces of weight. There’s also a Damascus version that’s of questionable value, but that’s up to you. All Links use Speed Safe assisted opening actuated by a flipper tab and have liner locks. There are plain edge, serrated, and tanto versions as well as a variety of colors and finishes – including a new anodized blue finish with an American flag silhouette for this year. The Link offers a lot of knife for the money, made in America – a refreshing thing to see these days. If you like the concept but want something a little sleeker, the new Dividend model offers the same options – GFN or Aluminum and 420HC both around $40, but with a 3” hollow ground Wharncliffe blade. At the time of writing here the Induction is very close to its official release – we reviewed a sample and it’s fantastic. Who doesn’t love Grant & Gavin Hawk? The father and son design duo are responsible for some of the absolute coolest knives on the market. The list is long – the fantastic Buck 830 Marksman flipper with its innovative strap lock and crazy smooth pivot, the Kershaw E.T. folder that won most innovative American made design of the year at the 2005 Blade Show, the Chris Reeve Ti-Spine, the Kershaw R.A.M., the dirt-resistant M.U.D.D. folder that was produced originally by ZT and is now being made by Millit, and more. Their bread and butter is finding better ways to build a mouse trap, including the new Deadlock OTF knife that has eliminated blade play in the open position – something no other OTF has been able to do so far. The Induction is their latest production collaboration with Kershaw, and it brings some of the funky G&G Hawk flavor to a more budget conscious audience, with a $59.99 MSRP and an expected street price around $40 when it becomes available to consumers. The main feature of the induction is the Hawk Lock, which uses a toggle style slider on a spring to engage the tang when opened, similar to an Axis lock. This lock was also used on the R.A.M. knife a few years ago to great acclaim. The increased detent strength of the Hawk Lock versus an axis lock should help the Induction pull off the manual flipper it’s sporting, a rare occurrence for Kershaw these days. The black aluminum handle has GFN inserts for a solid grip, and the blade (8Cr13MoV) has a black and satin two tone finish that gives it a classy appearance. How often do you come across a folding knife with the tip broken off? It’s a shame, really. A perfectly good knife cut short in the prime of its life due to gross misuse. Nothing breaks my heart quite like a PM2 with the tip broken off, because someone doesn’t know how to use a knife correctly. It’s part of the reason I don’t lend my knife to people I don’t trust – “can I use your knife?” usually has a silent “to pry open this paint can” at the end of it. Well worry no more with the Kershaw Barge, a clever solution to an old problem: you want to use your knife as a pry bar? How about we include a pry bar on your knife? The Barge’s party trick is a stainless steel pry bar that protrudes from the end of the handle, integrated into the backspacer itself. It looks like a pretty decent pry bar, too: chisel ground so it can slide into crates and lift them open. The design is quite stout – the backspacer forms the spine of the pry bar and it reaches almost halfway up the spine of the handle. Three torx screws secure the backspacer along the spine, and two oversized flathead screws anchor the pry bar at the end of the handle. Perhaps overkill but creating strength for the pry bar while giving the whole frame of the knife rigidity is a good idea when it’s serving dual purposes. At the other end of the knife, there’s a 2.6” modified Wharncliffe blade made from 8Cr13MoV, with a high hollow grind and a shallow swedge on the top making a practical utility blade shape. The downward pointing tip is great for packaging and boxes, making the barge a great knife for someone who works in a shop or in shipping. The Barge has a framelock for the blade, and it’s a manual opener with a thumb stud. No more broken tips, yours for around $20. Kershaw produces a large number of Emerson designed knives featuring Ernest’s patented wave opener mechanism – a protrusion from the spine of the blade that when drawn from the pocket pulls the knife open by itself – so picking just one is hard. For us, the most practical is the CQC-6K. The blade shape is a long, sleek clip point with a deep swedge and a half-height flat grind (on both sides, unlike Emerson produced knives which are almost all chisel ground) for a strong tip for penetrating cuts. Blade steel isn’t anything to write home about, but the 8Cr14MoV blade has a dual surface finish – stonewashed on the primary bevel, satin finished on the flats – a rare bit of attention to detail, especially at the CQC-6K’s sub-$40 price point! Action is by the Wave opener or the removable thumb disc, and a stout stainless frame lock supports the blade when open. Like a “real” Emerson the CQC-6K is built with common hardware – the pivot is a large flathead screw, and the body screws are smaller Phillips screws. In fact, the CQC series offers a lot of the Emerson experience at a fraction of the Emerson cost – with better fit and finish and a more practical V ground blade to boot. Also worth considering is the newly introduced, extra-beefy CQC-4KXL with a 3.9” spear point blade for under $40 – hard to go wrong. There are so many great Kershaw products that it’s hard to narrow this list down, but two others deserve a mention in this article. The Launch series (numbered 1 through 7) is a set of American-made automatic knives that Kershaw has rolled out over the past few years to great critical acclaim. While the market for automatics is limited due to legal reasons, the tide is gradually changing on this (considering it doesn’t make sense anyway) and the Launch knives are some of the best values in the auto market. Almost all of them use aluminum handles and CPM-154 steel, and all use a plunge lock that also serves as the blade release. Launch 1 has a 3.5” clip point blade, Launch 2 has a slender 3.375” drop point, and Launch 3 has a broader 3.375” drop point. Launch 4 is designed as a California-legal(!) auto, with a blade length a touch under 2” that has been met with rave reviews. Launch 5 is an Emerson design, with a 3.5” clip point blade and solid ergonomics – a deep finger choil and a steep thumb ramp. Launch 6 is a larger knife, a 3.75” drop point blade with a stiletto style handle, and Launch 7 is a sleek 3.75” clip point with an angular handle designed by Tim Galyean. They’re all extremely well built and offer top notch performance for $75-$105, a fraction of what some other “high end” autos cost. The Agile is Kershaw’s production version of Hinderer’s new MP-1. It has a 2.75” stonewashed Sheepsfoot shaped blade made from 8Cr13MoV, with Speed Safe assisted opening via a flipper or a thumb stud. It’s a stainless steel framelock with some decorative machining on both sides. That’s not what’s interesting, the backspacer is. The MP-1 it’s based on stands for “modular platform” and the Agile shares this design: it comes with three different backspacers which can be changed out with one hex screw. There’s one with a bottle opener (of course! ), one with a lanyard hole, and one with a screwdriver. The Hinderer MP-1 has a 3.25” blade made from S35VN and titanium scales, but considering it’s $400 more expensive the Agile seems like a pretty good deal. Do you like our list? Did we forget your favorite Kershaw knife? Send us an email!